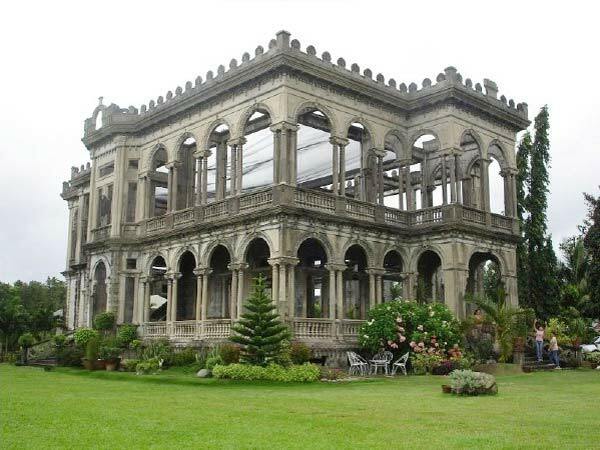 It's inevitable to visit the ancestral homes of Silay without catching wind of the late Don Mariano Ledesma Lacson's burned-down mansion in Talisay commonly known as The Ruins. It's by far the most majestic and lavish of the houses built by sugar during its time. Initially, I thought I would see another big wooden sturcture. But what I saw reminded me of the Parthenon in Greece. It was a magnificent massif of concrete columns rising high from the vast sugar field that has been democratized to a housing development within a subdivision. It's a classic juxtaposition of past and present. The mansion was built after the death of Don Mariano Lacson's wife, Maria Braga in 1911. Its design was inspired by Italian and neo-Romanesque architecture. Felipe, one of the sons, meticulously supervised the construction ensuring that only high grade concrete was used. This is evidenced by the column's marble-like finish. The 4-tiered fountain was painstakingly looked after by a Japanese gardener. When war broke out, he was nowhere to be found. It was later learned he was an informer. It's interesting to note that this corroborates my grandfather's anecdote. In Los Baños, Laguna, many Japanese drifters worked as farm hands. When war broke out, they all assumed their officer rank in the Japanese Imperial Army. This makes me think that the Japanese attack on Pearl Harbor was not a retaliation against US shakedown, but part of a meticulously planned imperialist expansion...but I digress. When World War II broke out, it was feared that the invading Japanese army would commandeer the mansion as its headquarters. As a pre-emptive move, the USAFFE (US Armed Forces in the Far East) guerrillas burned the mansion down. It took 2 days of inferno until the 2-inch wooden floors and the roofing caved-in. Only the concrete foundation remained due to its over sized steel bars and high grade concrete mixture. Nowadays, the grounds and the ruins remain impeccably manicured. They have a café-style resto offering Mediterranean cuisine. The Ruins is also venue for special events - weddings, photo shoots, concerts, etc. They even have an 18-hole mini-golf course. Huh? Rewind that. 18-hole mini-golf course? What were they thinking? Maybe it's just me, but I think a mini-golf course detracts from the imposing historical drama The Ruins imparts. But the café is genius...if they can play Chopin in the background. When I see these magnificent relics of the past, I can't help but think what it would be like to live at a time when a place is experiencing its renaissance period. It's being at the right place at the right time. The US enjoyed its gilded era at the turn of last century when the Vanderbilts ruled and owned several palacial mansions, some of them considered countryside cottages for the holidays (like the one I went to in upstate New York along the Rudson River). The sugar barons of Negros had theirs in no small measure. Now, sugar remains essential, but with competing sweetener substitutes, it's no longer a monopoly. With that, fortunes have been moderated (no more vacation villas in Europe). That heyday is over. But there's The Ruins as an decadent reminder of a bygone era when sugar was king and Negrenses defined the roaring 20s. along Lacson St., preferably at Robinsons, take any jeep going north to Silay. Ask the driver to drop you off at the Pepsi plant. P8, 15 mins. at the tricycle queue, take a trike to The Ruins. P20, 10 mins.